Our office and factory will be closed from 5.30pm on 23rd December 2013 and will reopen at 8.30am on 2nd January 2014. Please note that for us to guarantee standard delivery of materials before Christmas, orders must be placed with us by 1.00pm Wednesday 18th December 2013. • Before 1.00pm on Friday 20th December 2013 (if hazardous before 11am), after this date we cannot guarantee delivery before the Christmas shut down. • The last day for collections will be Monday 23rd December 2013 before 4.00pm. • Normal deliveries will resume Thursday 2nd January 2014 8.30am. 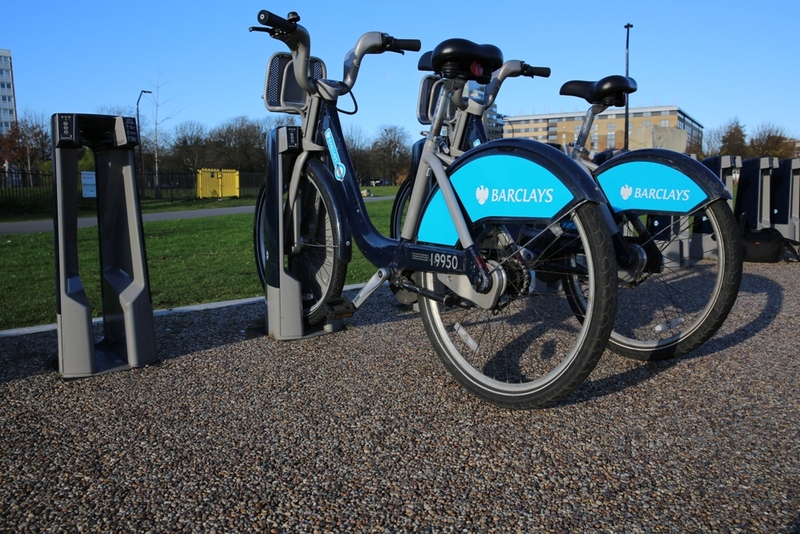 Eco Resin Bound Surfacing has been used in Shoreditch Park to provide a strong base for the docking station for Barclays Cycle Hire bicycles or as they are generally known Boris’s bikes. Eco Resin Bound Surfacing provides an attractive slip-resistant alternative to traditional paving and the permeability of the SuDs compliant system prevents pooling of surface water, keeping paths puddle free. The resistance of the resin to ultra-violet light ensures that the resin will not yellow or darken and will remain elastic, lengthening the service life of the system which is strong enough to stand light vehicle traffic, heavy footfall and most certainly bicycles. 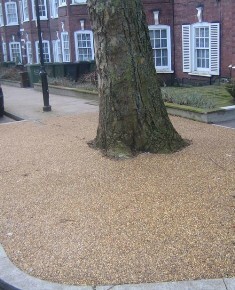 Eco Resin Bound systems are being applied across London boroughs as councils find out about the benefits of the SuDS compliant resin bound and tree pit systems. The London Borough of Hackney has made extensive use of RonaDeck Eco Tree Pit Systems to protect trees within the borough and tree pit has also been used in neighbouring Islington. 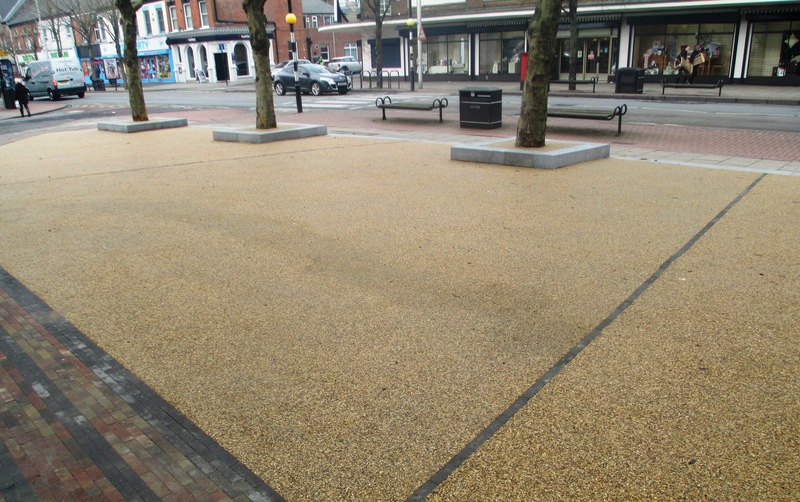 One of the largest resin bound surfacing projects took place at Shepherd’s Bush Green in the Borough of Hammersmith where over 7,500 metres have been laid. The Queen’s Walk along the South Bank in the Borough of Southwark was resin bound in time for the Jubilee Pageant part of the Diamond Jubilee celebrations. The driveway of a new home in Belper Derbyshire was laid with 400 square metres of Eco Resin Bound Surfacing with an Autumn Forest aggregate blend. The permeable paving was laid by Ronacrete Approved Contractor Truestone Surfacing. Resin bound surfacing at Belper home. Gillshill Primary School in Hull has had its playground resurfaced and enhanced with the application of RonaDeck Resin Bound Surfacing by Route One Highways. Architect Adrian Richmond of the NPS Group chose three shades of aggregate to create an inviting entrance to the school. Sesame Gold was laid to 20m2, Collux Dark Blue to a further 22 m2 and the largest area covering 82 m2 was surfaced with Honey Jerez Yellow. The RonaDeck Resin Bound Surfacing System was supplied as a two-component UV stable polyurethane resin, the two components were mixed with a slow speed drill and paddle before being added to a forced action mixer containing the aggregate blend. Ronacrete Approved Contractor Route One Highways spread the RonaDeck Resin Bound Surfacing to level and smoothed the surface with a steel float. The finished surface was ready for the feet of many children within four hours. 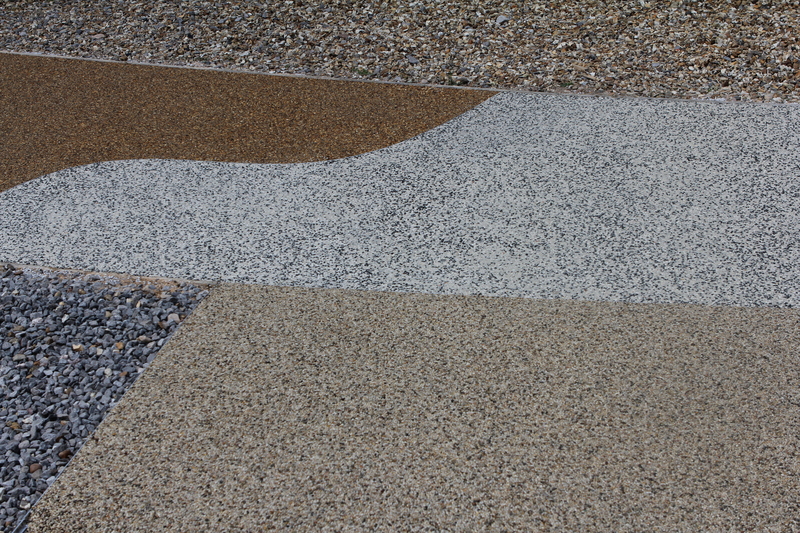 RonaDeck Resin Bound Surfacing satisfies SuDS requirements, allowing rainwater to quickly and easily drain through the porous surface, avoiding puddling. 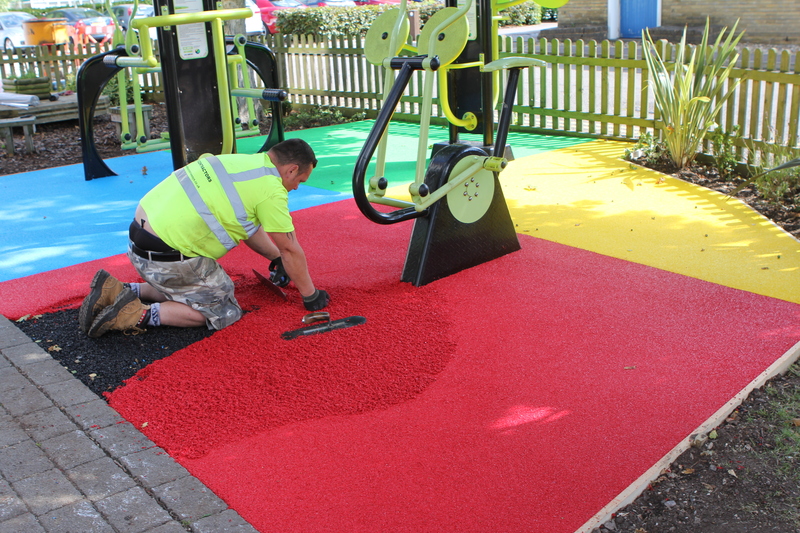 Slip testing shows risk of slip to be generally low, obviously an important consideration for a school playground. 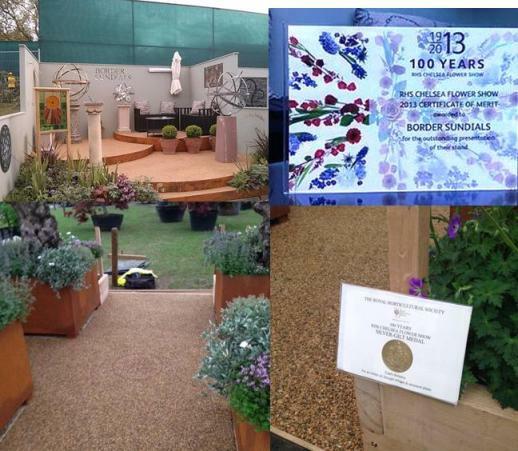 Two companies exhibiting at the Chelsea Flower Show who incorporated Eco Resin Bound permeable paving in their stand design have won awards. 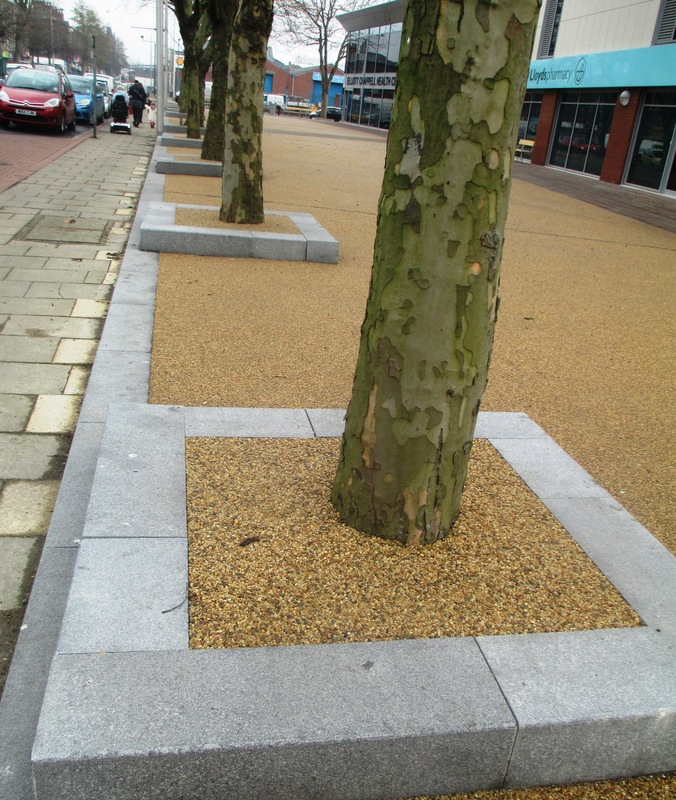 Essex based mail order, tree supplier Todd’s Botanics on stand GPF18 won a Silver Gilt award for the stand Eco Resin Bound permeable paving provided an attractive backdrop to the trees and bushes on display. A Golden Harvest blend was selected to cover the eight square metres of floor and Terracotta aggregate was used to feature the Todd’s Botanic logo on the ground. Abergavenny sundial designer and manufacturer, Border Sundials’ stand RGB9 covers approximately 20 square metres and is a stepped construction with each step covered in Eco Resin Bound permeable paving with a Sesame Gold aggregate blend. Border Sundials were awarded a certificate of merit for outstanding presentation. 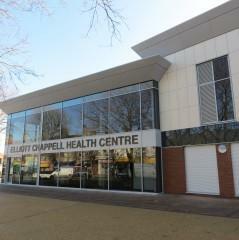 The surfacing was laid to each stand by Hertfordshire based, Eco Resin Bound Approved Contractor Graveltech. Ronacrete exhibited for the first time at the EcoBuild Exhibition from March 5th to 7th. The launch of Ronacrete’s new EcoBound range drew crowds to the stand and the Ronacrete sales team had barely a minute to spare over the three days of the exhibition, drawing interest right until the exhibition’s closing minutes. “We were delighted that so many people wanted to find out more about how the EcoBound range offers a range of systems that have eco credentials at every level, sub base, resin, aggregates, even cleaners.